Late last night, after markets closed for the weekend, following an extended discussion the European finance ministers announced their "bailout" solution for Russian oligarch depositor-haven Cyprus: a €13 billion bailout (Europe's fifth) with a huge twist: the implementation of what has been the biggest taboo in European bailouts to date - the impairment of depositors, and a fresh, full blown escalation in the status quo's war against savers everywhere. Specifically, Cyprus will impose a levy of 6.75% on deposits of less than €100,000 - the ceiling for European Union account insurance, which is now effectively gone following this case study - and 9.9% above that. The measures will raise €5.8 billion, Dutch Finance Minister Jeroen Dijsselbloem, who leads the group of euro-area ministers, said. But it doesn't stop there: a partial "bail-in" of junior bondholders is also possible, as for the first time ever the entire liability structure of a European bank - even if it is a Cypriot bank - is open season for impairments. The logical question: why here, and why now? And what happens when the Cypriot bank run that has taken the country by storm this morning spreads everywhere else, now that the scab over Europe's biggest festering wound is torn throughout the periphery as all the other PIIGS realize they too are expendable on the altar of mollifying voters and investors in the other countries that make up Europe's disunion. Officials have struggled to find an agreement that would rescue Cyprus, which accounts for just half of a percent of the euro region’s economy, without unsettling investors in larger countries and sparking a new round of market contagion. Policy makers began meeting at 5 p.m. yesterday in a hastily convened gathering, seeking to overcome differences on bondholder losses while financial markets were closed. “Further measures concern the increase of the withholding tax on capital income, a restructuring and recapitalisation of banks, an increase of the statutory corporate income tax rate and a bail-in of junior bondholders,” according to a communique released by ministers after the talks. It didn’t specify whether bank or sovereign bond holders could be affected. The European Central Bank will use its existing facilities to make funds available to Cypriot banks as needed to counter potential bank runs. Depositors will receive bank equity as compensation. Finance Minister Michael Sarris said the plan was the “least onerous” of the options Cyprus faced to stay afloat. “It’s not a pleasant outcome, especially of course for the people involved,” said Sarris. 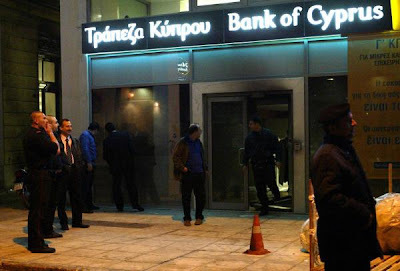 The Cypriot parliament will convene tomorrow to vote on legislation needed for the bailout. "I'm extremely angry. I worked years and years to get it together and now I am losing it on the say-so of the Dutch and the Germans," said British-Cypriot Andy Georgiou, 54, who returned to Cyprus in mid-2012 with his savings. The island's bailout had repeatedly been delayed amid concerns from other EU states that its close business relations with Russia, and a banking system flush with Russian cash, made it a conduit for money-laundering. "My understanding is that the Russian government is ready to make a contribution with an extension of the loan and a reduction of the interest rate," said the EU's top economic official, Olli Rehn. Almost half of [Cyprus'] depositors are believed to be non-resident Russians, but most of those queuing on Saturday at automatic teller machines to pull out cash appeared to be Cypriots. While "saving", pardon the pun, yet another insolvent country merely has the intent of keeping it in the Eurozone, and thus preserving Europe's doomed monetary block and bank equity for a little longer, this idiotic plan will achieve two things: i) infuriate not just Russians but very wealthy, and very trigger-happy Russians. The revenge of Gazpromia will be short and swift, and we certainly would not want to be Europeans next winter when the average heating level of Western European will depend on the whims of Russian natural gas pipeline traffic; ii) start a wave of bank runs first in Cyprus and soon everywhere else that has the potential of being the next Cyrpus. While the tax on deposits will hurt wealthy Russians with money in Cypriot banks, it will also sting ordinary citizens. Some ATMs in the country have run out of cash, Erotokritos Chlorakiotis, general manager of the Cooperative Central Bank, told state-run CYBC. Europe's response: this is a unique situation. Just like the Greek bailout was unique; just like the Irish and Portuguese bailouts were unique; just like the bailout of Spanish banks was unique. Skeptics including Luxembourg’s Jean-Claude Juncker had said that imposing investor losses in Cyprus risked reigniting the financial crisis that has so far pushed five of the euro zone’s 17 members to seek aid. Last year, the euro area took what officials called a unique step to ask Greek bondholders to absorb losses. ... Until it does repeat itself of course - after all the fundamental problem for Europe has never been resolved: the continent is still broke, and it still is running out of good, unencumbered assets (which as being repledged by the banking oligarchy) with every passing day. What is known, however is that Cypriots have taken the news in stride.... and to their local ATM machine, which sadly is showing the following message: "Your transaction has been cancelled due to a technical issue. This ATM cannot complete withdrawals at this time" (courtesy of Yannis Mouzakis). This is totally disgusting. They call this a bail in, and not a bail out. All these names give me the spooks. This is nothing more than robbery. The guy from http://sentiment-trader.blogspot.com/ and who is very accurate with this market calls, is saying this will be the next catalyst for the market to fall and sell off.